You are facing retail theft (shoplifting) charges in Florida and you are wondering two primary questions: (1) will the other side be able to prove their case? and (2) what penalties could I face if convicted? If you are charged with shoplifting in Florida, it is a good idea to hire a local retail theft attorney to help you defend against the charge and mitigate any possible penalties you may face as a result. Any of the above actions are classified as retail theft if they are done with the intent to deprive the store of use, benefit, possession, or its full retail value. Under the Florida law known as the “Shopkeeper’s Privilege”, a store employee may detain a person in their store if they have a reasonable belief that a suspect has committed the crime, detains the suspect in a reasonable manner, and detains the suspect for a reasonable amount of time to investigate whether the suspect has the goods alleged to be stolen. There are several classifications of retail theft depending on the combined value of property stolen. Each of these classifications has a different potential fine again primarily depending on the combined value of the property and whether it is the first or second conviction. 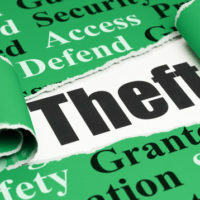 First Degree Petit Theft: Taking or moving property with a combined value between $100 and $300. If you are convicted of first degree petit theft,you may face a fine of up to $1,000 and up to one year in jail. Second Degree Petit Theft: Second degree petit theft occurs when the suspect takes property with a total combined value of one hundred dollars. If you are convicted of second degree petit theft, you would owe up to $1,000 in fines or up to 60 days in jail. Third Degree Grand Theft: Third degree grand theft occurs when a suspect shoplifts property with a combined value between $300 and $20,000. If convicted with a third degree grand theft, the suspect may face fines of up to $5,000 or up to 5 years in prison. Second Degree Grand Theft: Second degree grand theft occurs when a person shoplifts property with a combined value between $20,000 and $100,000. If convicted, a person may face fines of up to $10,000 or 15 years in prison. If you are charged with retail theft, you should not try to represent yourself in the proceedings given the potential penalties outlined above. Contact the experienced Winter Park retail theft attorneys at Cotter & Zelman, P.A. to discuss your case to develop the best strategy moving forward and understand the potential scope of penalties you may face.